This is the latest in a series of posts based on the USTFCCCA’s newly unveiled NCAA Division I Indoor Track & Field Championships History page – the most comprehensive collection of the meet’s history anywhere on the web – leading up to the 2015 edition March 13-14 in Fayetteville, Arkansas. The page can be viewed in its entirety here. Next up in our treasure trove of pre-NCAA data: the all-time best marks recorded at the NCAA meet in each event. 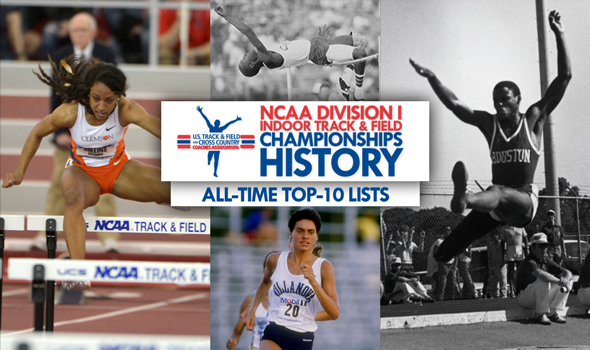 You can view the first-ever list of the all-time top-10 performances and top-10 performers in each current event at the NCAA Division I Indoor Championships here. Like every piece of the report, there’s too much here to cover fully in less than ten thousand words or so, but here are a few highlights of this one. So, other sports get to consider long-dead athletes all-timers. But track? We can look at results from the ’20s and ’30s and accurately dismiss them as worse than a mediocre high school state meet. All this is to say: if you posted a mark decades ago that stacks up with modern athletes, it means you did something extremely, extremely special. The vast, vast majority of the marks on these lists came after 1999. A not-insignificant amount of marks came in the 1990s. So, for the men, I’m arbitrarily drawing the old school line at 1990. Considering that the women’s meet only started in 1983, I’m drawing that line at pre-1995. That might be a little unfair to the women—12 years after the men’s meet started would be 1977. **Incredibly, Huber won the mile in the exact same time in consecutive years. Note that Nyambui was the only one to contribute a mark from the 1970s, and Beamon the only one from the 1960s. And Lewis and Conway’s jumps records are by far the oldest meet records on the books: every other men’s or women’s meet record has been broken since 1997. 1. All six of the top performances in the 200 were run between 2000 and 2007; all of the top three men later served suspensions for positive drug tests, though Wallace Spearmon’s was for something that he could have filed a TUE for, and John Capel’s was for marijuana. 2. Kerron Clement’s 44.57 winning 400 in 2005 might be the greatest single race in NCAA history. It’s still the world record; in the decade since he ran it, only Kirani James in 2011 has broken 45.00 indoors; Deon Lendore’s time at SEC’s last year is tied for the second fastest in the world in the last decade. 3. There’s been plenty of contextualizing of how ridiculous it is that Bernard Lagat is still competing professionally, but here’s some more. Lagat is older than or the same age as Kevin Sullivan, Bryan Berryhill, and Seneca Lassiter, all of who join him on the top ten list in the mile. Those three have all been coaching (Sullivan at Michigan, Berryhill at Wyoming, Lassiter at the high school level) since at least 2010. Lagat ran a 3:54 mile three weeks ago. 1. We’re in the golden age of the women’s 60 meters right now. 2. With two less decades on the books, women have more of a chance to turn in historically dominant performances. Lawi Lalang—with four—is the only man to have more than two marks in this report. Tia Brooks has five, Brittany Riley and Brianna Rollisn have four, and LaKya Brookins, Trecia Smith, Brianne Theisen-Eaton, Felisha Johnson, Brigetta Barrett, Hazel Clark, English Gardner, and the Texas 4×4 have three each. 3. Brianna Rollins was outrageously good in 2013. The 0.08 second gap between her winning time in the final that year and the third best performer in NCAA meet history is greater than the gap between the event record holder and the tenth best performer in NCAA meet history in every 60 meter event. 1. A combo cheese-grater/FAT timer would be the greatest kitchen appliance of all time. 2. Writing this sentence in way that held off millennium/century pedants was torturous. CHAMPIONSHIPS HISTORY: How Does Oregon’s Five-Man 3000m Crew Stack Up Historically?